In the 17th century, people who practised medicine usually got their training on the job, sometimes with a formal apprenticeship. Bishops had the power to license medical practitioners: physicians, surgeons and midwives. This power could be devolved to archdeacons, which in the case of Winslow meant the Archdeacon of St Albans on behalf of the Bishop of London. There was also one Winslow recipient of a medical licence from the Archbishop of Canterbury: Henry Heale in 1635 (www.lambethpalacelibrary.org/files/Medical_Licences.pdf). He is recorded as having been prohibited from practising in London and sent into the country (1635). William Stewart of Winslow, practitioner in physic, was licensed by the Bishop of London in 1663 (J. Harvey Bloom & R. Rutson James, Medical Practitioners in the Diocese of London 1529-1725 (Cambridge, 1935), 70). He had a letter stating that he had been in practice about 12 years, and was 7 years with Mr William Reynolds at Great Shelford, Cambs. It was signed by the vicar, Samuel Dix, and many others. "William Stenward", probably the same man, had a son Charles born on 7 April 1658 and baptised at Winslow on 15 May. Many people clearly practised medicine without an ecclesiastical licence, and in some cases applying for a licence involved providing testimonials from already satisfied patients. When the Archdeacon made his annual visitation, he might receive requests for licences or ask to see them, and there are some records of this for Winslow in the St Albans Archdeaconry Acts (Herts RO 7/37) - in heavily abbreviated and badly written Latin. The main penalty for practising without a licence was excommunication, which was of no significance to non-Anglicans (Evenden 2000, 46-47), but having one provided some protection and status. John Greene of the parish of Winslow appeared and exhibited his licence to practise surgery and sought to have it admitted (2s 6d). Emma Green is to send a certificate for a Lycense to practise midwifery. Joseph Dandridge, schoolmaster and surgeon, is to exhibit his licence of surgery. He was cited personally on the 27th inst. to show his licence and did not appear. Jane Stevens, cited by William Hunt, did not appear and was to send a certificate. Male surgeons might be members of the Company of Barber-Surgeons, but most who received ecclesiastical licences appear not to have been (Evenden 1998, 203). Apparently John Greene already had his licence and he paid a fee for the Archdeacon to recognise it. Joseph Dandridge must have claimed to have one, and at the 1693 manor court he called himself a "barber chirurgeon", which suggests that he belonged to the Company, but perhaps he avoided the extra cost involved in an ecclesiastical licence. The Archdeacon's Visitation of Oct 1684 records that "George Harding of Winslow clerk is licensed" (Herts RO ASA7/37) but he was described as a surgeon at the Bucks Quarter Sessions, 1684. A midwife in the Diocese of London had to provide a testimonial certificate signed by a clergyman and neighbours, medical practitioners or clients (Evenden 2000, 34). This was the certificate which Emma Green was to send. She also needed six women to attend and take an oath on her behalf. A woman from Cheshunt had to travel to London to get her licence, at a cost of £1-£2 (Evenden 2000, 37-38), and perhaps Emma was required to do the same, although licences could also be issued at the visitation. Jane Stevens was probably said to be practising as a midwife without a licence, and was therefore required to go through the process of getting one. Mary Gyles wife of William Gyles was found to have introduced a letter to exercise the art of surgery (Chirurgii). The Lord (Archdeacon) called for the said letter, etc. The first three women seem already to have had licences, although if Mrs Greene is the same person as Emma Green she must later have allowed hers to lapse. Mrs Steward might be the wife of William Stewart the physician. Winslow already had one female surgeon, and Mary Gyles had begun the process of becoming its second. Female surgeons might be expected to restrict themselves to gynaecological problems, but that was not always the case: Elizabeth Moore of Market Harborough treated scrofula and Mary Rose of Portsmouth had seamen among her patients (Evenden 1998, 207-8). Women who applied for a surgery licence had to provide testimonials from medical practioners and satisfied patients, and according to Evenden were only likely to receive a licence if they restricted their practice to areas in which male surgeons were not interested. Mary Gyles had a further problem in acquiring a licence: she was a well-known Baptist, and the licences were issued by the Church of England. She is not likely to have received any help from the strongly anti-Baptist vicar John Croft who arrived in Winslow in November 1684. She probably applied for a licence not because she expected to get one but because someone had complained that she was practising surgery without having one. In 1692 her husband William Gyles was cited before the Archdeacon by three leading Anglicans (Thomas Godwin, Henry Hughes and Charles Bowler) for an offence whose nature is unclear; perhaps it was connected with Mary's medical practice. She was still involved in medicine when she made her will in 1704, as she bequeathed to her daughter-in-law Anne Gyles "my Still and the Frame belonging to the same and my Stone Mortarr and all my Surrupp Glasses Surrupp and Stilld Waters in and belonging to the same and my Saves and Oyles". 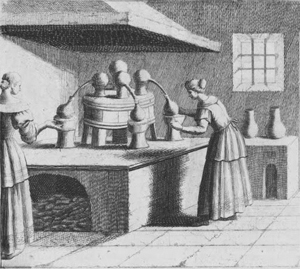 The still and frame (for distilling medicines) may have looked like the one in the engraving on the right. Medical services were also provided by apothecaries who made and sold drugs. The first one recorded in Winslow is Charles Harris (d.1675), whose £16-worth of stock when he died included "Elecutuarys Conserves Species Syrups Ung(uen)t[?] ayles pills and other Ingredients", some of which he had probably bought from "a drugster of London". He evidently did not have a very profitable business as his debts were £9 more than his assets.